An online series that resumes Another World on May 4, 2009. The story is written in episodic form and fans are given choices to guide the storyline. The site includes character descriptions, a discussion board, e-mail subscription, and F.A.Q pages. Other content includes archived interviews with former cast members, most notably Danielle Jean Burns (Nancy), and Jackee Harry (Lily Mason). In 2010, Telenext Media and Procter and Gamble ceased being affiliated with Another World Today due to lack of support and the author continued the project on her own. The last episode was posted on December 29, 2014. A relatively accurate narrative of the Alice/Steven/Rachel romantic triangle as originally conceived by headwriter Agnes Nixon and continued by Robert Cenedella on the television drama, Another World. 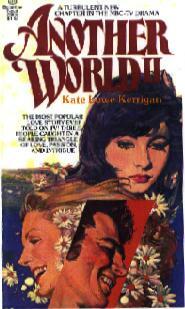 Written in the style of a romance novel, the book includes nearly all major characters on Another World at the time. Long-time viewers will enjoy reliving this exciting time in Another World's history. This book joined other 70's soap opera novelizations, including those for All My Children, General hospital, and The Secret Storm. Readers may recall these memorable scenes from the program which are recreated in the novel: Rachel's introduction to the show (novel) as a model at Bryant's department store; her disastrous marriage to Russ Matthews; Alice and Steven's first meeting; Rachel's search for her father in Somerset; Alice's engagement party where Rachel revealed her affair with Steven; Jamie's birth and all its ramifications on the Matthews family; Alice's extended trip to Europe (when Jacqueline Courtney left the show for a year); Alice's dream house; and Alice and Steven's first wedding. The books ends with Alice and Steven's honeymoon in St. Croix, a happy ending of sorts. Another World fans will know that there is much more of this story to be told. 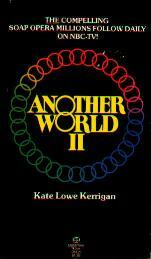 It's continued in Kerrigan's second installment, a sequel called Another World II. Kerrigan does a good job of recreating the televised story and has a feel for most of the characters (particularly Ada Davis and surprisingly, Mary Matthews). The biggest flaw in the book is its point of view. Perhaps unintentionally, Kerrigan has a much better handle on the character of Rachel than she does Alice. The story is, to a large degree, told through Rachel's eyes. This is understandable because, by 1978, the year the novel was published, Jacqueline Courtney had left the role of Alice, and Rachel was emerging as Another World's romantic lead. Perhaps Kerrigan has lost sight of the fact that, during the entire seven or eight year run of the televised romance (from the late 60s through the mid 70s), Alice, not Rachel, was Another World's heroine and ingenue. The Rachel portrayed in the book is, however, the "old Rachel," the villainess that much more closely resembled an early Erica Kane (on whom Agnes Nixon based Rachel) than today's "reformed" Rachel. 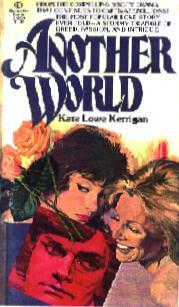 Kerrigan's Another World is not great literature, in fact, it's not even a particularly great romance novel. The greatness of the book comes from the fact that it preserves the history of one of the most popular and long-running romances in the history of daytime TV. The back cover includes a short character description of Alice, Steven, and Rachel followed by the cryptic statement; "Their lives came together in a search for something more - something they might find only in . . . Another World." In no way are the television series head writers, Agnes Nixon and Robert Cenedella given credit for creating the storylines. However, a Procter & Gamble Productions, Inc. copyright appears on the front-matter page which follows the title page. "A publishing friend of mine sent me a newspaper advertisement for a large luncheon discussion program featuring stars of Another World. Among the names and photographs displayed in the ad was that of an unknown writer credited as author of the serial. I called Paul (Rauch) immediately for an explanation. He could hardly disclaim knowledge of the occasion since he was also listed as a guest at it, but he implied that Bob Short preferred I not attend an event planned to promote a paperbound book based on work I had written for the show. I wasn't aware such a book was being published and took my complaints to Bob, who referred me to my contract which reserved all rights to the material for Procter & Gamble. I could accept this but not the discourtesy of being uninformed of the book's existance and advertising which gave credit to someone else for material I had cut myself off from much of my life to write..."
Another World II begins when Jamie is three years old and includes memorable moments from the TV series including: Alice's pregnancy and subsequent miscarriage; Walter Curtain's death; Alice's revelation that Steven was secretly spending time with Jamie and Rachel when Jamie is rushed to the hospital after a snake bite; Gerald Davis' manipulation of Alice causing her to overhear and misunderstand a late-night conversation between Steven and Rachel; Alice's escape to New York City where she meets Elliot, Iris, and Dennis Carrington and Louise Goddard; Janice Frame's first arrival in Bay City, as Rachel's ally! ; Rachel's marriage to Steven and her insistence upon living in the house he had built for Alice; Iris's bugging of Elliot's suite (a popular storyline during the Watergate era); Gerald Davis's testimony against his own daughter in Rachel's divorce hearing; Alice and Steven's second wedding when John Randolph arrived drunk; Gerald's harassment of Steven in prison resulting in Steven's being sent to a maximum security facility; Gerald's last conversations with Rachel in prison (his final appearance on the show); Alice's nervous breakdown and commitment to Dr. Richard Gavin's sanitarium; and Alice and Steven's final reconciliation. As in the first book, many of the series' major characters are included, although most are relegated to supporting roles. Their own storylines, played-out on television, are for the most part ignored in the novel. Another World II is after all, the story of the Alice/Steven/Rachel triangle. Lenore's murder trial, Pat's poisoning by her housekeeper, Bill Matthew's death -- all important developments on the TV series, are neither mentioned nor contradicted in the book. This books moves on a deeper emotional level than the first novel. It is an adult drama with adult conflict. The hatred between Alice and Rachel is evident. Rachel is not merely a comedic thorn in the side of Alice and Steven; she is the bane of their existance and nearly destroys their relationship. In the first novel, Kerrigan "tells" us the story in a too simplified, almost cartoony style. In Another World II, however, she does a much better job of "showing" us the struggle and pain of each character. Through her use of dialogue, we learn the story from the characters, not through an omnipresent narrator. Alice is more fully developed as a believable woman in this novel, while Rachel's desperation comes across in full-force; she is depicted as she was on the series, a scheming, manipulative opportunist determined to get what she wants. Harding Lemay's desire to show Rachel's more sympathetic side is illustrated for the first time in the novel (as on the series) during her divorce from Steven, when she is double-crossed by her father. At this cathartic time for both the character and the series, we for the first time, feel sorry for Rachel. "(Rachel) was a fighter, she was tough, she bounced back. She also discovered that Steven Frame wasn't the only millionaire in town." A short description of the three main characters (Alice, Steven, and Rachel) is printed on the back cover followed by, "A compelling story of three lovers intertwined in a desperate struggle for survival in . . . Another World." The television series head writer, Harding Lemay (by this point in the storyline), is given no credit; however a Procter & Gamble Productions Inc. copyright appears on the front-matter page which follows the title page. Using the show's early scripts and stories, Pioneer Communications Networks Inc. worked with a team of romance writers to produce a series of paperback novels tracing the plot history of Another World. Covers featured generic romance novel couples in standard clinches. Mary Ann Cooper, an authority on soap opera, was the editor of the series, which encompassed fourteen books, published monthly, and ran from 1986-1987. The books covered the years 1967-1976, zipping through those early years to settle on the Steve/Alice and Mac/Rachel/Iris storylines. It took a devil-may-care attitude toward the actual details. For example, in the first book, Danny Fargo was knifed to death, when on the show he had been shot; Missy named Ricky after a favorite high school teacher instead of her father. Ted worked at the Hearthside Inn instead of the Fireside Inn. Yet other details were meticulous. In the third book, Rachel conning $50 out of Pat was accurate save for the location of the scene. Poor sales ended the series. It seemed people wanted their soaps on-screen, acted by the people they'd come to love. No. 1: Let's Love Again. Missy/Bill; Sam/Lee; Pat/John and Mike Bauer.